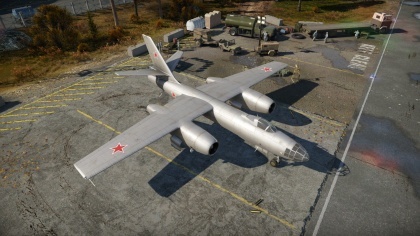 The IL-28 is a Rank V Soviet jet bomber with a battle rating of 8.0 (AB/RB/SB). It was introduced in Update 1.43. Being a jet bomber, the Soviet post-war IL-28 occupies the traditional role of "fast bomber" previously endowed to aircraft like the Pe-2-359 Peshka. Thus, its major advantage is being able to quickly swoop down to the target area and dispense its payload without being caught by enemy aircraft. The IL-28 relies on speed, acceleration, bomb capacity, and defensive capabilities to survive. 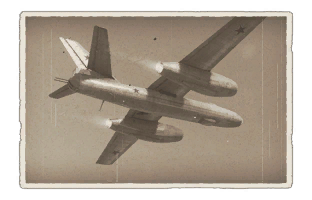 Unlike some of the aircraft the IL-28 may face, it is able to quickly accelerate, leaving would-be attackers in the dust. This single facet of the aircraft's performance is often a gamechanger, as it allows the IL-28 to quickly disengage from any dogfight or bombing run. This aircraft features a wide range of payload options including up to 3000 kg of bombs stored in the aircraft's internal bomb bay. To the naked eye, this rather minuscule payload may seem insignificant. However, by utilizing this aircraft's strengths pilots may find themselves able to single-handedly win the match by destroying all of the enemy's ground targets and running down their ticket count. This tactic of attrition is more than plausible, especially on realistic battles maps like Korea, where ground targets are often fairly centrally located and thus easy to destroy. Unlike its American and British counterparts, the IL-28 features a heavy-hitting defensive armament of two 23 mm NR-23 cannons mounted in the tail barbette. This turret setup is unique in that it features an extremely high degree of maneuverability, able to almost fire straight up and down. This single aspect of the IL-28 is what truly makes it a legendary aircraft, especially among the War Thunder community. Often described as being able to fire "23 mm lasers", the IL-28's tail cannons are capable of equipping belts composed entirely of destructive fragmentation incendiary tracer ammunition. The NR-23 cannons also fire unusually quickly, which makes the aircraft's one second burst mass very high. This makes the aircraft more than capable of defending itself, an invaluable asset in Rank V battles. There are also several 105 mm armored glass plates surrounding the tail gunner which makes him very hard to knock out. The IL-28 also wields two of these weapons in forward-facing positions under the nose, which allows the aircraft to destroy softer targets like AAA and artillery. While the 23 mm cannons are extremely potent when they strike both ground and air units, the fact that they fire so quickly makes it very possible to run out of ammunition even when firing in short bursts. Thus, a good aim is essential for success when using these weapons. The same issue applies to the IL-28's tail guns, which utilize the same cannons but with a larger ammunition pool. Having the crew "reload speed" upgrade maxed out allows the aircraft's tail guns to reload much faster which can be invaluable during an engagement. The tail gun can also be used to finish off softer ground targets after a failed frontal attack. The IL-28 starts off with twelve 100 kg bombs which in some cases are not enough to make a true impact on the match's result. Therefore, attaining the "KD-3" and "BD-4" bomb upgrades is essential. Having these allows the IL-28 to destroy heavier ground targets such as heavy and medium tanks, pillboxes, and various heavy naval units like destroyers. 10 mm Steel plate under the nose. 10 mm Steel plates in the front seat. 10 mm Steel plates in the pilot's seat. 105 mm Bulletproof glass in front of tail gunner. 10 mm Steel plates in front of tail gunner. 30 mm Steel plate under tail gunner. Due to its impressive low-altitude maneuvering capabilities (for a medium bomber), the IL-28 can be utilized in a variety of roles. In all game modes, if a teammate is struggling to evade an assailant, the IL-28 may be able to provide supporting fire with its dual 23 mm cannons. The aircraft is hampered in this role partly because of its mediocre roll rate and low ammunition count for its forward-firing cannons. If its bomb load is expended, the IL-28 is also a very capable "gunship", or a bomber aircraft whose role is to attract, distract, and destroy enemy aircraft. Other aircraft that can perform this role include the G8N1 Renzan, IL-10 (1946), B-29 Superfortress, and B-24D Liberator, among others. The most valuable modules of this aircraft are among the most difficult to attain; the KD-3 bomb upgrade is fairly mandatory for destroying any type of heavy ground target successfully, and having the Turret 23 mm and New 23 mm cannons (turret) upgrades increase the effectiveness of the aircraft's tail guns. However, being able to outrun an enemy before even engaging is often extremely useful as well. The IL-28 was created to meet a requirement for a bomber to carry a 3,000 kilogram payload at 800 kph (500 mph). Although there were several previous attempts to create such an aircraft the IL-28 was the first successful design. It incorporated the new Rolls-Royce Nene engines, produced as the unlicensed "RD-45". After the completion of testing in 1949 the aircraft was ordered into production on 14 May 1949, with the new Klimov VK-1, an improved version of the previous RD-45. The IL-28 was widely exported, and was utilized by almost all of the Warsaw Pact nations along with various Middle Eastern and African nations. It was license built in China as the Harbin H-5 and in Czechoslovakia as the Avia B-228. It is known to still be in service today in the Korean People's Air Force (KPAF). Although few in number, they provide North Korea with a means of strategically bombing targets.